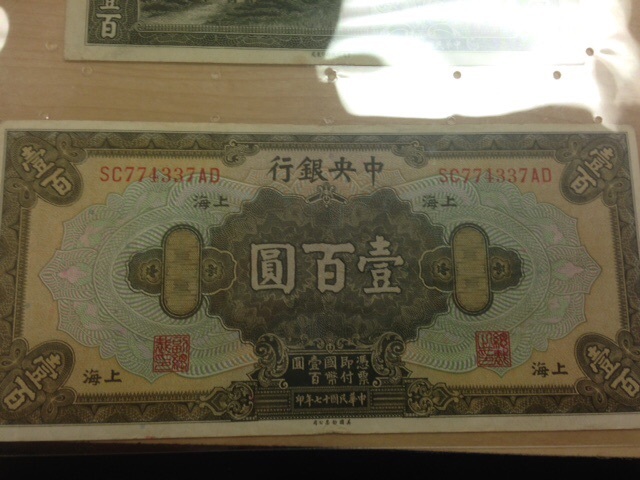 The currency that I have selected here is an old bill from Shanghai printed by the Central Bank of China (although I believe it was printed in the United States for reasons I will state later). 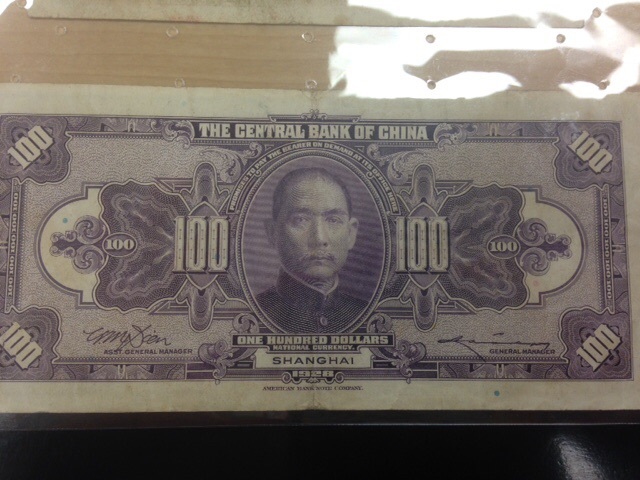 The currency is in the denomination of 100 and was printed in the 1860’s. I believe it was printed in the US because of the english style of imagery and image placement as well as the text on the front side of the bill. The denominations in the corners, the extremely complicated geometrical patterns (for counterfitting precautions most likely), and the face in an oval in the middle of the bill are all traditional things found on American currency. What really makes me think this though is the english lettering found on the bill that reads “The Central Bank of China” , ” One Hundred Dollars” and “Shanghai”. I tried to think of reasons why a Chinese bank in the 1860’s would use english lettering on the front of their bill and the main thing I could think of was it was printed in the US. There are even signatures on the bottom left and right sides of the bill which are also found on US Currency. The color scheme is very simple and things are very symmetrical on this bill and are fitted nicely by a rectangular pattern that encompasses all the information (images and type). Now, on the back of the bill, this bank uses a more traditional asian esque feel. I am familiar with Japanese currency and this style resonates with me. The colors are what immediately makes me think this, it is a brown/tan color with a greenish tinge, this is found on many asian currency’s. In addition, the gold ovals on the left and right sides resemble old asian coins. There are more obvious signs of its asian trademarks such as the Chinese writing on the corners where the denominations were on the front of the bill as well as all the english text. It is essentially a copy of the front, but completely turning its once US/American feel into a Chinese one. This is where the bill both has continuity but at the same time is very different on each side. I feel like I am viewing two different bills from two different countries with their own styles. The only similarities in each side is really the formatting/plaecment of its text and symbols. Both have a geometric pattern on the inside and the text on the top and bottom middle as well as its rectangular outline. I'm Stefan Lindeman, I am from Seattle WA and currently attending school at WSU in Pullman WA.